The shaded relief maps are not satellite images. They are created from arrays of elevation data. 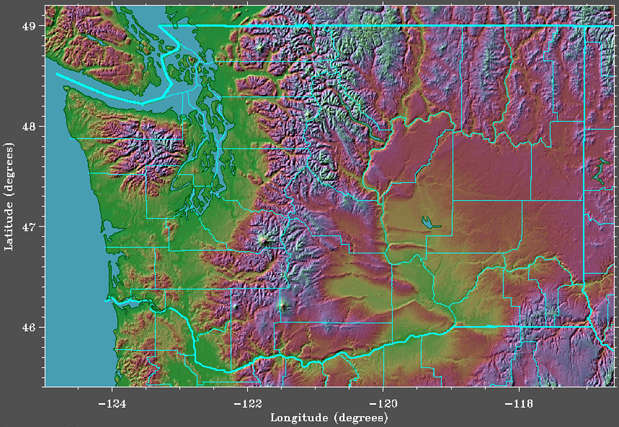 The elevation data was derived from contour maps elsewhere, some is available from the USGS. The Map Projection is Cylindrical Equidistant with the shape corrected for mid-latitude of the map. Lighting is from the northwest. The elevation data has a horizontal resolution of 1/2 arc minute in both dimensions and a vertical resolution of 20 feet. The coastlines, rivers, and boundaries are from the CIA database. County map boundaries are from the USGS Digital Line Graph files.